Caught between dimensions? Celebrate Star Trek's 50th birthday! The weekly NBC series that launched on Sept. 8, 1966 spawned spin-off series and movies, and became one of the most influential franchises worldwide. 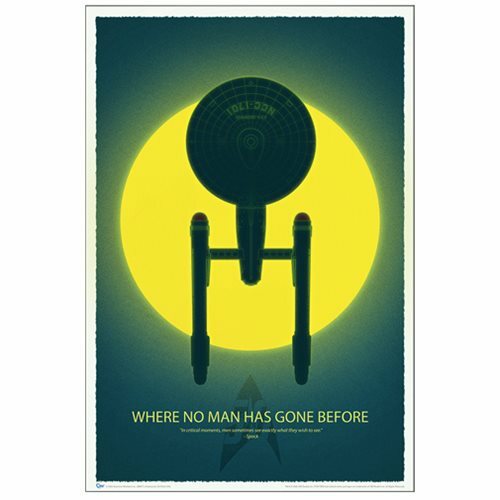 Quantum Mechanix' artists are honoring Star Trek with the starship Enterprise silhouetted against a blazing yellow sun. Below is this quote from Spock in The Tholian Web (Season 3, Episode 9 of the original TV series): "In critical moments, men sometimes see exactly what they wish to see." Join the party with this museum-quality art print and wish Star Trek a very happy golden anniversary. Print measures 27-inches by 40-inches. 100 lb satin-finish paper. Ages 13 and up.